Treat yourself or a loved one to a spa day at Woolley Grange. Our relaxing spa is located in a contemporary oak-timber building, blending into the Bath stone wall of the kitchen garden. From our oh-so-warm indoor pool you can enjoy a wonderful view of the walled garden. Take a gentle swim here, followed by a session in the sauna or steam room. In the summer months, relax by the outdoor pool. In the spa, enjoy an excellent Elemis or Jessica treatment. Our zoned areas offer a tranquil environment for adults to unwind and our skilled therapists enable you to do just that. Afterwards, you can chill out with magazines and newspapers in the spa reception. If you have time, we recommend a stroll around our 14-acre grounds, where the tranquility is palpable. When the weather is less inviting, enjoy a seat by the fire in one of the comfortable lounges of our Jacobean manor house. Can you think of a better way to spend a day? Below are some of the spa treats we have available. 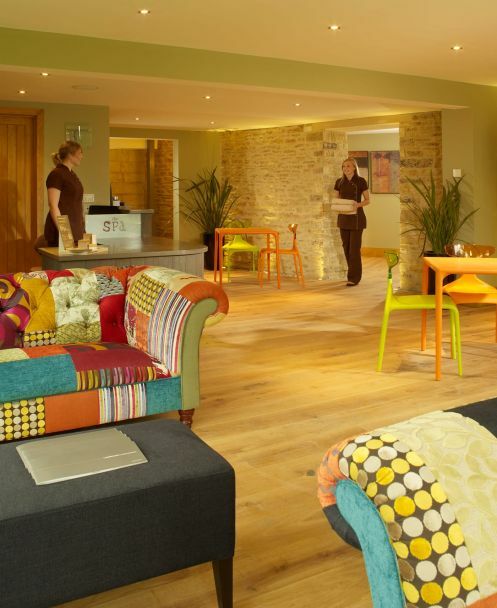 You can book by emailing thespa@woolleygrangehotel.co.uk or by calling 01225 865979. Alternatively, why not buy that special someone a gift voucher? An ideal present for Christmas, anniversaries, birthdays and weddings. A wonderful treat, however young or old! You can both enjoy a file and polish followed by a chat over tea or coffee and cake in our relaxing luxury hotel. £40 for two. Enjoy a 30-minute Elemis or Jessica treatment of your choice (see brochure below for details), tea, coffee or a soft drink, and full use of the spa facilities including pools (indoor and outdoor in the summer), steam room and sauna, and the beautiful gardens of Woolley Grange. This spa day is available from Monday to Friday in school term times. £55 per person. Enjoy a 30-minute Elemis or Jessica treatment of your choice (see brochure below for details), tea, coffee or a soft drink on arrival, a two-course lunch or full afternoon tea in the restaurant, and full use of the spa facilities including the heated indoor pool (plus heated outdoor pool in the summer), steam room and sauna, and the beautiful gardens of Woolley Grange. This spa day is available from Monday to Friday in school term times. £70 per person. You can also upgrade to a 60-minute treatment for an extra £20. Please ask the Spa when booking. A real pamper day! Enjoy a drink on arrival, followed by a guided show around and then relax with a massage and a facial, followed by a two-course lunch or full afternoon tea in the restaurant. Chill out by the indoor heated pool (and the outdoor heated pool in the summer), steam room and sauna, and the beautiful gardens of Woolley Grange. This spa day is available from Monday to Friday in school term times. £150 per person. A fun and relaxing break for both of you! Enjoy a drink for yourself and your child on arrival and then leave your little one in the Woolley Bears Den, our Ofsted-registered Kids' Club, to enjoy an hour of fun with our qualified childcare staff, while you enjoy a 60-minute Elemis or Jessica treatment of your choice. Afterwards, enjoy a relax by the pool and a delicious two-course lunch or afternoon tea with your child. £120 adult and child. Additional child: £25. A combination of nourishing face and body treatments that tends to the unique requirements of mothers-to-be. Duration is 2hrs 15mins. This spa day is available from Monday to Friday in school term times. £180 per person. You can also come to the Spa at Woolley Grange just for a treatment. We have a lovely range of Elemis and Jessica treatments available, including the Elemis revolutionary BIOTEC facials, wonderful Elemis deep tissue massages and exotic lime and ginger body scrubs. For more details, take a look at the brochure below. Just call us on 01225 865979 to book (leave a message if we're busy in treatments) or email thespa@woolleygrangehotel.co.uk. Gift vouchers are also available to purchase online for 30-minute spa treatments (£40) or 60-minute treatments (£60).